For optimal Emsculpt results, we recommended your treatment plan consist of 4 half-hour sessions, conducted twice a week for two weeks. The cost of each treatment is $750, or $3,000 for all four treatments. This cost is regardless of the area being treated. Emsculpt treatment areas can include the abdomen, buttocks, thighs, arms, lower back and calves. We recommend booking a complimentary consultation to find out if you are a candidate for Emsculpt. 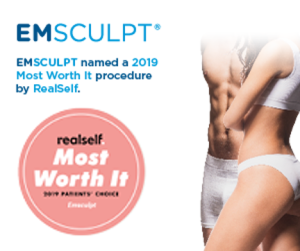 During your consultation we will give you an exact price for your treatments, including any Limited Time Emsculpt Specials we are currently offering. We also offer Emsculpt Packages. These are helpful, especially when addressing multiple areas of the body. Emsculpt is a very affordable treatment, especially when compared to invasive surgical procedures. Our certified and experienced Emsculpt practitioners will work with you to customize an appropriate treatment plan. We can also discuss available financing options if needed. We will assess the areas to be treated and the number of treatments needed to achieve your goals. We will then be able to give you an exact price for your Emsculpt treatments, including any limited time Emsculpt Packages we are currently offering. Package pricing for maintenance is also available. We are a premier Denver Emsculpt Certified Practice. We offer affordable and cost effective Emsculpt treatments with an upfront pricing policy. Injector 5280 also offers patients the option of financing Emsculpt treatments. This gives you the ability to finance all or part of your Emsculpt treatment. Financing allows you to begin treatment immediately, so you can get started feeling and looking your best. Qualifying candidates are able to pay for their treatment over time. We have 12 or 18 month financing options to choose from. During your complimentary consultation, please ask our certified Emsculpt practitioners about financing options.